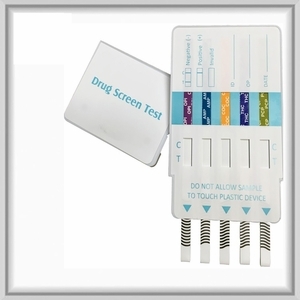 The term NIDA-5 refers to a five-panel drug test specified by the National Institute for Drug Abuse. You might also hear it called the SAMHSA-5 drug test. This test is compulsory for federal employees and companies that use professional drivers for safety-sensitive operations. Although other companies do not need to follow the NIDA-5 standard, it�s still the most common urine drug test. This group of drugs was specified decades ago based on the prevalent drug use at the time. Although many prescription drugs, such as ADHD medications, will be detected in a NIDA-5 test, many others will not. If a color band is not visible in each of the control region or a color band is only visible in each of the test region, the test is invalid. Another test should be run to re-evaluate the specimen. Note: Test lines are not of equal intensity or color. Some organizations with drug-free workplace programs qualify for insurance incentives, such as decreased costs for workers� compensation and other kinds of insurance.